This is a scone recipe that’s pretty well known, using lemonade and cream. I’m not completely convinced that this combination is better than sugar and butter. Anyway, I gave this recipe a go. It’s from The Australian Women’s Weekly Love to Bake. They call it “Strawberry Bliss Scones”, but I think it’s more of a scone cake. It’s filled with fresh strawberries and white chocolate. Here’s the recipe with a few tweaks. I took the oven temperature down to 200 degrees C from the recommended 220 degrees C which I thought was too hot. Preheat oven to 200 degrees C. Line 2 trays with baking paper. Sift flour into a large bowl and mix in chocolate. Combine lemonade and cream in a jug and pour over the flour mixture. Using a knife, cut liquid through flour mixture until it starts to clump. Add strawberries and continue to combine until the mixture comes together forming a dough. Be careful not to over work or the dough will be tough. Divide dough in half. Shape one half into an 18cm round on 1 tray with floured hands. Mark the round into 4 wedges, using the back of a floured knife. Repeat with the remaining dough and tray. Bake scone cakes for 25 minutes, swapping trays on shelves halfway through cooking time, or until tops are golden brown. Dust scones with sifted icing sugar. Serve in wedges as is or with more cream! 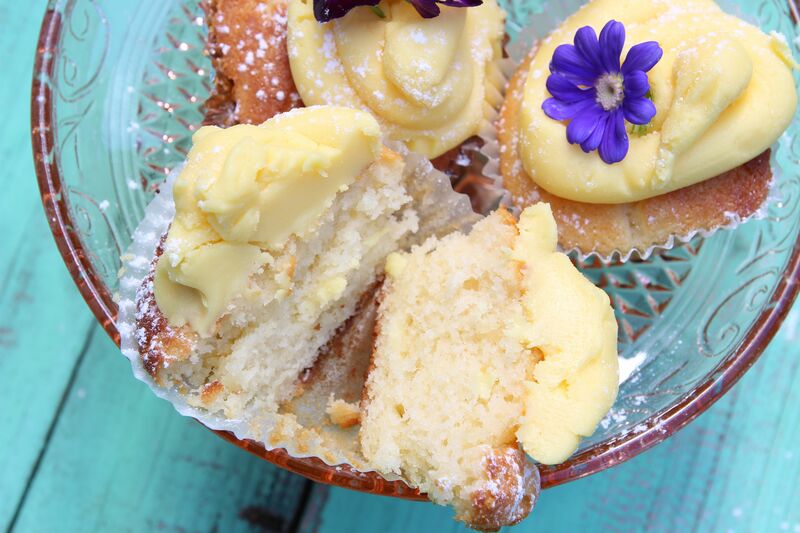 Posted in Cakes, Sweet Food and tagged afternoon tea, berries, lemonade, The Australian Women’s Weekly, white chocolate. Bookmark the permalink. Berry Cheesecake Trifle was my in between Christmas and New year pudding for a family and friends lunchtime gathering. Technically it was still Christmas – the 29 December – if you do the Twelve Days of Christmas thing. The day was super hot – 38 degrees C! Luckily most of the fare was cold, and this cheesecake trifle, while quite filling, was refreshing with its large quantities of cool and fragrant berries. 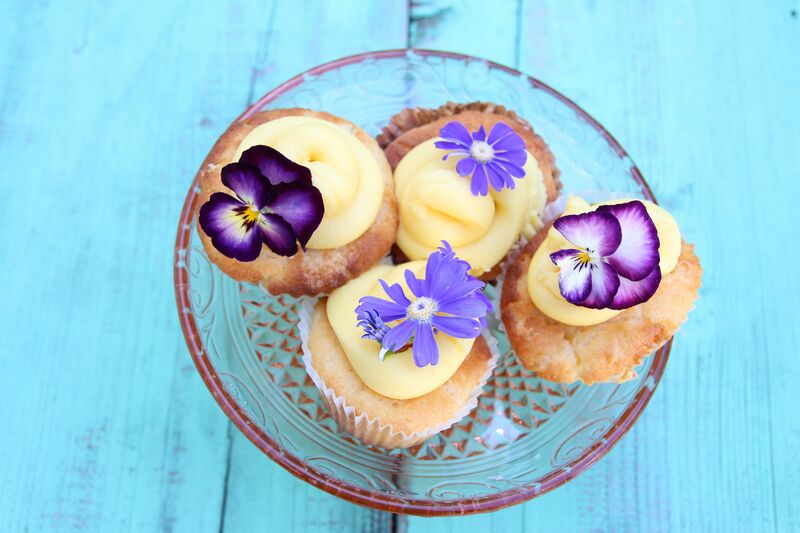 The recipe is adapted from a recipe created by Queen Vanilla products and Dr Oetker products. I liked the idea of the cheesecake filling instead of custard and cream. The recipe also created some green chocolate bark, which I thought pretty festive too. 4 x 250g punnets berries (strawberries, raspberries, blueberries, or any others you fancy). Frozen berries are fine too, I used a mixture of both. Combine all the berries in bowl, leaving a good handful for decorating the top of the trifle. You should cut the strawberries in halves unless they are tiny. Splosh on some orange liqueur, and add a little caster sugar to taste if the berries need sweetening. Leave for a few hours to allow the berries to release their juices. Cut up the sponge into squares about 5 cms 0r 2 inches. It really doesn’t matter too much – they just need to be able to fit into your trifle bowl. You will also need to cut some odd shapes to fill in the gaps. Make a layer of sponge on the bottom of the bowl. Add a decent layer of berries, making sure you spoon some of the liquid over the cake so that it turns red. To make the cheesecake filling, beat cream cheese and butter with an electric mixer until smooth and creamy. Add icing sugar gradually, beating till the mixture is well combined. Add the vanilla bean paste. Whip the cream in separate bowl until just thickened, then fold into the cheesecake mixture. Add layer of cheesecake mixture to the berries layer in the trifle bowl. Repeat the layering – sponge, berries and juices and cheesecake mixture, ending with a berry layer. The number of layers you get will depend on the size of your bowl and your generosity in layering. As you can see from the photo I got 3 layers of sponge and berries and 2 of cheesecake mixture. You should leave enough of the cheesecake mixture to decorate the top (3 tablespoons or so should do it). Refrigerate until ready to finish the decorations and serve. To make green chocolate bark, heat the white chocolate in small pieces in a microwave safe bowl on medium power in 30 second intervals, stirring in between each interval, until the chocolate is completely melted. Add the green food colouring and chopped Oreos. Spread the mixture onto a baking tray lined with baking paper. Refrigerate until set. To finish the trifle, pile the remaining cheesecake mixture on the top of the trifle. Scatter the left over berries on the top of the “snowy” mixture. I used only fresh raspberries for the top, as they looked the most elegant. Break up the green chocolate bark and place as artistically – or in my case rustically – as you please. You don’t need to use all the bark – the recipe makes quite a large quantity. On the other hand if there are small children around they will love the white (now green) chocolate and you could use the whole lot on the pudding! Posted in Cakes, Dessert, Sweet Food and tagged berries, cheesecake, cream cheese, festive dessert, pudding, sponge cake, vanilla bean paste., white chocolate. Bookmark the permalink. This is what I was cooking this time 3 years ago, in May 2013. It’s an ultra rich blondie inspired by a Gordon Ramsay recipe. 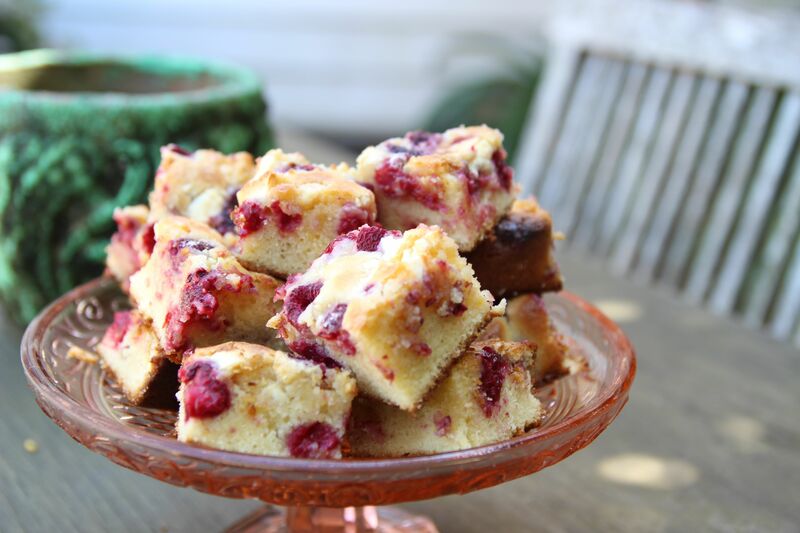 I thought it worth revisiting – it’s easy to make, really fudgy, and the cranberries give a nice, slightly tart note to offset the caramel sweetness. Line a 23cm x 23cm tin with baking paper. Melt butter, add sugar to mixing bowl. Add salt to sugar. Add melted butter to sugar and whisk well. Add vanilla and eggs, whisk well. Add baking powder and bi-carbonate of soda, mix well. Whisk in half the flour. Once incorporated (no lumps), add the rest of the flour and mix well until there are no lumps. Add the dried cranberries, changing from a whisk to a spoon. Slice the bars of white chocolate into thick matchsticks and mix in gently, trying not to break up the chocolate. Spoon into baking tin (previously lined with baking paper (butter or non stick spray the tin to hold paper in place). Spread mixture into the tin, using a spatula to make sure the mixture is even. Bake at 180 degrees C for 35 -40 minutes. Leave to cool, then remove from tin. Cut into squares. Blondies will keep for a week and also freeze well. 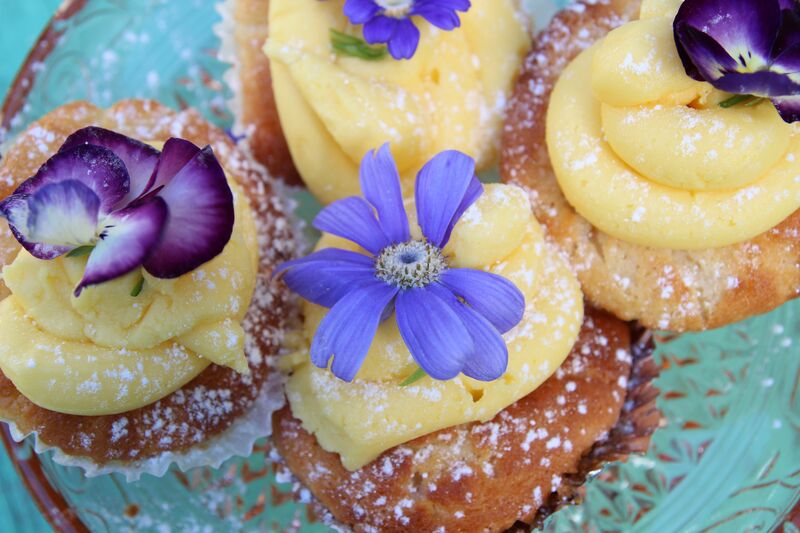 Posted in Biscuits and Slices, Dessert, Small Baked Things, Sweet Food and tagged afternoon tea, blondies, brownies, cranberries, Gordon Ramsay, slice, traybake, white chocolate. Bookmark the permalink. I was inspired to make this recipe from The Baker’s Wardrobe blog: http://thebakerswardrobe.wordpress.com, with a few of my own tweaks. I was surprised that the blondies rose without baking powder! 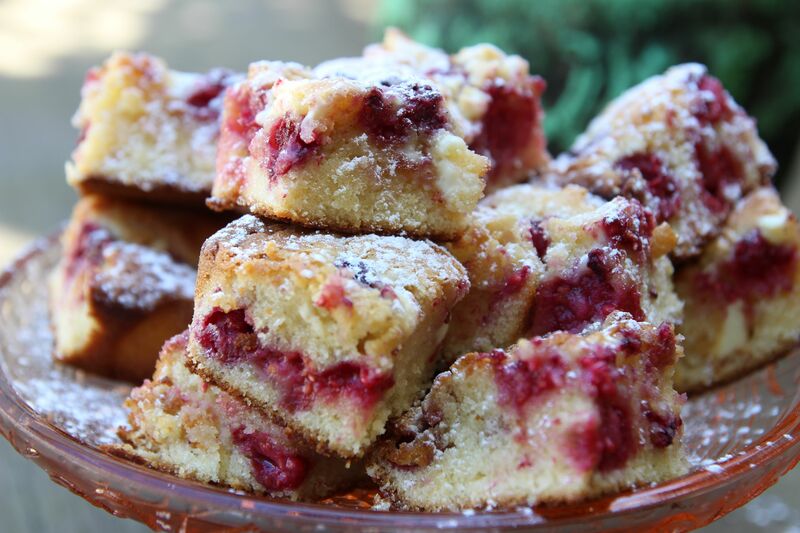 They are a very sweet blondie but the raspberries cut down a little on the sweetness. Preheat the oven to to 180 degrees C or 170 degrees fan forced. Grease and line a 20 cm x 20 cm baking tin with baking paper. Melt the butter and 100g of the white chocolate in a small saucepan over low heat and stir until smooth. Beat the sugar, eggs and vanilla paste in a bowl until the mixture is thick. Gently combine the the butter and white chocolate mixture into the egg and sugar mixture. Gently fold 1/3 of the flour into the batter and repeat twice until all the flour is all incorporated. 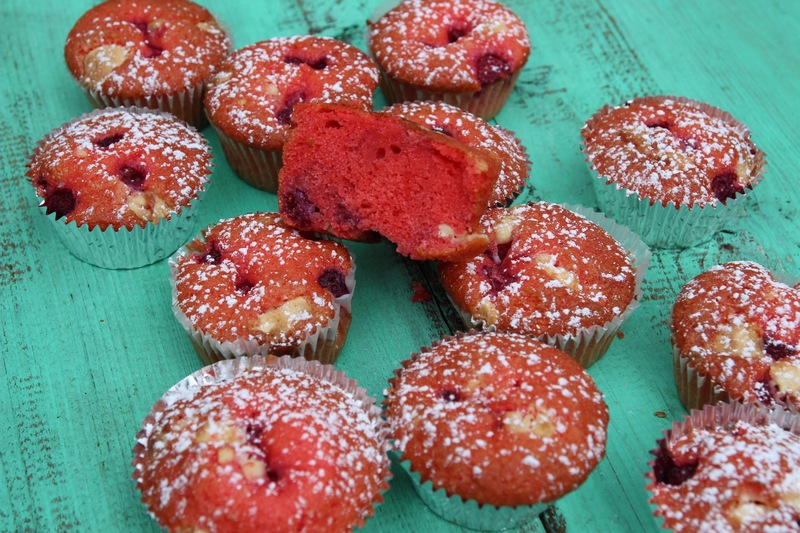 Mix half of the raspberries in the tablespoon of flour then gently fold the raspberries into the batter. 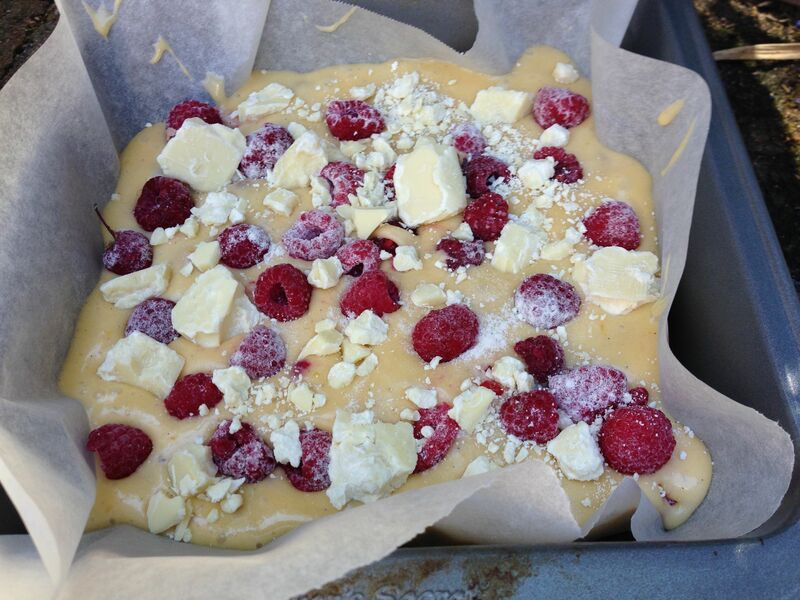 Pour the batter into the prepared tin and place the remaining white chocolate pieces and remaining raspberries over the top of the batter. Bake for 30- 35 minutes. The blondies will have risen but will still be slightly soft in the middle. Cool in the tin before cutting into squares. Posted in Biscuits and Slices, Cakes, Small Baked Things, Sweet Food and tagged afternoon tea, blondies, raspberries, white chocolate. Bookmark the permalink.